EH...but... what about usb dongle wireless? Shouldn't that work with both systems? Not supported by XBox One afaik. Come on, you're buying PS4 wireless headphones. You know what to do. I don't know that any wireless headset works with both PS4 and Xbox One because of the way Microsoft proprietarized (a perfectly cromulent word) their headset connections. Probably the best you can do is get your headphones of choice that work with one console (see this December Polygon roundup for ideas), and connect them wired to your controller for the other console. Sony has the same restriction with their bluetooth. The USB converter dongle is a workaround. For the record, I know there is a running joke about PS4 headsets, I am not familiar with the details and I am not just trying to stoke any fires. Sounds like EvilDead is confirming the USB converter should give me the solution I need. Now I just need a reliable wireless headset that won't break the bank! Yeah, so there are wireless headphones that work with PC and PS4, or PC and X1, but not all 3. I don't think that converter will work with the Xbox. That one is designed to mimic a PS4 wired headset. I would settle for pc and xbox, I suppose. I need all the help I can get though, I'm still super confused about what will or will not work though, so suggestions are super welcome. You can't go wrong with the Astro A50's. They're very popular. But since you initially mentioned a $30 headset, I suspect $300 is out of the price range you're looking for. You're not likely to find any reasonable quality without paying out some bucks though. I use the Sony Platinum headset, and I love it, but that's not very helpful if you want an Xbox headset. Looking like I'll have to spend ~$120 plus. ugh. You know, I bet you could find a decent Bluetooth pair to use on a PC that also lets you cable them to a console controller, which isn't really so bad, for less. So which style do you prefer? Over ear? On-ear? Ear bud? In-ear? Any style, really, but the problem is cabling. The cat I have eats the cables. Looking for recommendations for the wife. She wants new headphones but just for casual listening. Her favorite are quite out of style and I can only find them in wired form. She likes the over the ear/outside ear sport clip loose cable kind of headphones. The only thing similar I am finding is the hard around the back of the head connected over the ear outside the ear phones. Pictures would help to understand the form factor. My guess is something like this (not that I'm advocating for those)? Sorry meant to grab a photo too but kids interrupted me. So, I picked up some refurbed Sony WF-1000X Bluetooth headphones to use with my Pixel 2. They were $100 instead of the $200 list price. I wiped them off with isopropyl just for peace of mind even though I assume that was done to them. They looked fine. I don't know for sure if all the earbuds were replaced or not. They're incredible. 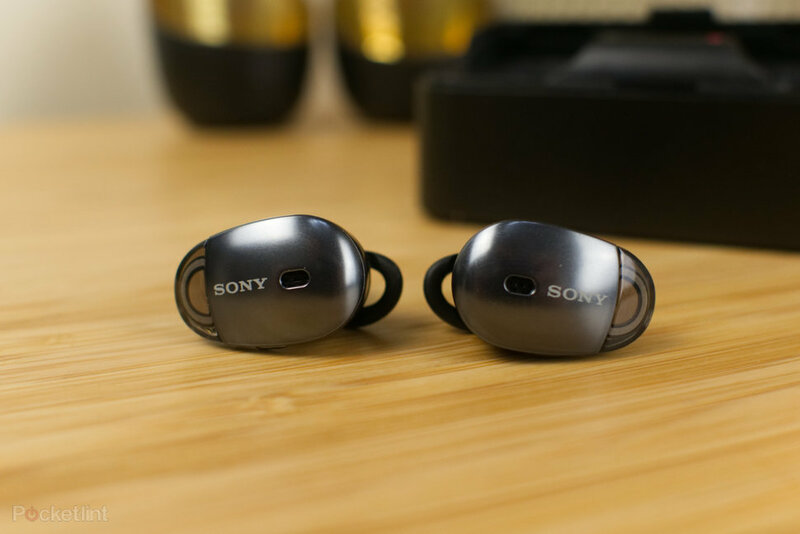 They really feel like a giant leap in tiny, in-ear, wireless headphone tech. For me, the fit is perfect. The noise cancelling is incredible, and the sound is completely acceptable. It has a tiny bit of tinniness to it, but it does have a decent low end, so it feels relatively balanced. I haven't used them on my commute yet, but the battery life should last my 90ish minute commute and give me a chance to recharge them for the return commute. Given that the battery life and expense of these things are the two main tradeoffs, it works out pretty well for me since my commute works with the battery life and I found the refurbished version for 50% off. Still searching for headphones as stated above but I have a quandary that may fit here. I have noticed with especially Bluetooth devices that volume jumps a lot while near the low end. Seems to be either too loud or to low when wanting a nice between 2 or 3 volume settings from the lowest end. I have noticed this in speakers & headphones. I had one cheap speaker that adjusted it's own internal volume instead of the phone volume. Any suggestions or thoughts to fix this? My experience is that you're at the mercy of how it's setup and there is no fix, but if you do find something I'm so very listening because I have the same issue constantly. My samsung level u pro headphones won't hold a charge anymore. Any suggestions for something similar? Any thoughts on these headphones (HD 598 SR) to replace my Sennheiser HD 555? Those don't look much different other than color to my HD598's. They're very nice, great sound quality, comfortable for hours, lasted me for years... No major complaints. I cant' say how they compare to the HD 555, but I've got the 598 SR's at home and love the comfort and sound quality. I've got Sony MDR-V6's at work, and thought there wouldn't be much difference between the closed-backs there and the open-back 598 SR. However the open sound stage is definitely noticeable and makes it easier to single out and pinpoint specific sounds, be it in a game or music. The only problem with the sound is the usual open-back problem: I like my audio loud, and so they make a lot of noise around me that may or may not bother my wife if she's in the room. The only other issue is the cord length for the 3.5MM jack. It's too short. I assume that's for easier phone use, but it's pretty annoying for computer use and kind of makes me want to replace my 598s with some nice wireless cans (when I have the money for the switch, that is). I am looking for a pair of headphones that have a band that go around behind your head (Like this) but have noise isolation or noise cancelling. I am hoping for something lightweight as I will be wearing them to listen to music/audiobooks while outside or exercising. I cannot use earbuds as they constantly fall out of my ears and normal headphones make it hard/impossible to wear a hat. Do headphones like this exist? I found these. I'm not sure about the noise cancelling, but they seem to be designed for exercising. The only person who can answer that is you. Do they sound nice to you? Are they comfortable? My guess is that, given that the headphones that replaced those when they were discontinued retails for $200, which is a better-than-entry-level pricepoint, you've probably got a solid pair of cans there that will last for years. EDIT - according to this glowing review of them, they retailed for < $100, but were also "widely considered to be among the best-sounding headphones under $100". Which is to say, unless you're planning on upping that budget for your next pair, you're not going to see mad gainz. Those Audio Technicas were legendary back in the day. Unless you're willing to spend a lot more for an upgrade, or if you need closed headphones for sound leakage issues, or want more bass.... probably no reason to get anything new. Only time they would have dropped below $100 is probably used or on clearance. Pretty sure they were at least $150 if not $200 when being sold new. No, if anything think about getting a dedicated DAC/Amp combo to go with them. My rule for audio stuff is it's easiest to upgrade from nothing to something. The incremental something to something better upgrades can really kill you (I recently bought custom foam pads for headphones, please do not follow in my footsteps). There were some great Black Friday sales, but that was before my headphones started falling apart. Are there usually sales throughout the year, or mainly then?